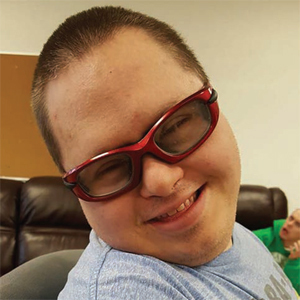 Adults with developmental disabilities do not have to be Maryland residents to enjoy the warm and loving care of Star Community. For individuals from other states or countries, Star Community provides private-pay residences. 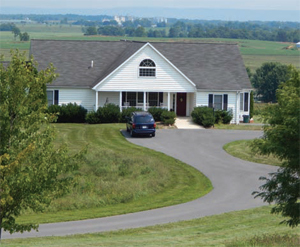 Star Community operates 11 group homes on a 145-acre campus near Hagerstown in historic and picturesque Western Maryland, a short distance from Pennsylvania, West Virginia, and Virginia. An exciting day program, an indoor swimming pool, two greenhouses, a sensory trail, two bocce ball courts, a renowned therapeutic equestrian center and therapeutic animal farm, a picnic pavilion, and a fishing pond enhance the Star Community experience. With its beautiful, well-groomed campus as the banquet, it is Star’s dedicated staff that sets the table for the feast by providing adults with developmental disabilities, challenging and fulfilling activities that are all too often out of reach for individuals with special needs. When Star welcomes a new resident, the person's needs and personality are carefully evaluated to ensure a compatible and harmonious match occurs with other residents. Star's residential group homes, each spectacularly different, can accommodate three to eight adults. The residential program has a total capacity of 53. Each group home provides a homelike atmosphere with professional care and supervision provided around the clock. Residents are encouraged to participate in day-to-day responsibilities within the homes to the best of their abilities, including meal preparation, table setting, cleaning, and other tasks. 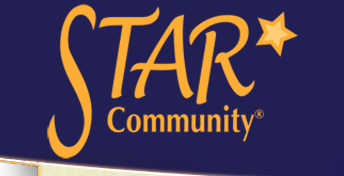 Because living in a community setting does not come naturally, Star’s staff coordinate leisure-time activities and promotes social skills so that each resident can achieve a successful, well-rounded life. To further promote our community living, each group home has a lovely communal dining room, a separate kitchen, and a family room. No two people with special needs are alike. While residents do have some similarities, our staff provide specific services tailored to each person. Particular attention is given to everyday needs, personal hygiene, and the overall cleanliness of all residents. In addition; a staff of registered nurses monitor their health and arrange for medical examinations and appointments, as well as supervising medication administration, storage, and replenishment. Empowering the Lives of the People We Serve! 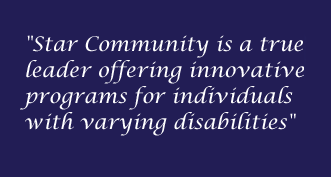 Star Community’s day-habilitation program, called Ventures, dovetails with Star’s residential program. Operating Monday thru Friday from 9 am to 3:30 pm, the program provides pre-vocational training, social interaction, and recreational opportunities based on individual interests and needs. The day program is organized into crews or small groups of adult participants. Each crew participates in different hands-on tasks and activities, and participants can move from crew to crew to the extent that openings allow. Among popular activities are creating greeting cards, making crafts, growing and caring for plants in Star’s greenhouses, landscaping at other community non-profits, painting, recycling electronics, sign-language lessons, shredding paper, and collecting and organizing used clothing to be given to residents in the community who are displaced by fires or other disasters. Music therapy, themed dances, carnival day, group picnics, Zumba, karaoke, spa days, bingo, Wii video games, and dress-up days, are also favorite activities. Three additional activities are on the top of almost everyone’s list. The first is spending a little me-time with Charlie, the Golden Retriever therapy dog. Friendly, cuddly, and always chipper, Charlie dispenses equal amounts of love, joy, and attention to all. The second is spending time with friends on the sensory trail. The sensory trail is a quarter-mile long paved trail with activity stations along the path. 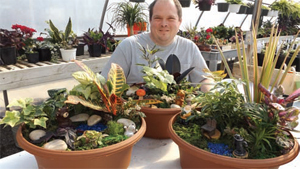 Features include a vertical garden with edible plants, a five-swing hexagon-shaped structure around a water fountain, an all-weather drum set, a gazebo, a vertical xylophone and gong, two wheel-chair swings, a roller table, and a tactile hut. Throughout the sensory trail area are picnic tables, benches, wind chimes, and hanging plants. The third is enjoying frequent community trips. Star’s beautiful rural location is near malls, stand-alone stores, religious institutions, national and community parks, restaurants, movie theaters, and cultural venues. A fleet of more than 30 vehicles is ready for transportation for day program and residential community integration opportunities. Star’s equestrian center is well known throughout the region for its outstanding programming for children and adults of all cognitive, physical, and social abilities. Individuals from age four to 80 have enjoyed the benefits of therapeutic riding in Star’s indoor and outdoor arenas. Significantly, the equestrian center maintains the elite accreditation of the Professional Association of Therapeutic Horsemanship (PATH International). This premier achievement verifies that the equestrian center’s instructors and equine specialists meet the highest standards in the field. Each equestrian center horse undergoes a 90 day trial period, during which the horse is ridden only by a certified trainer. This is to ensure that the horse has the temperament and ability to perform for the wide variety of challenged riders. In addition to equine activities, the equestrian center maintains a therapeutic farm with a friendly menagerie that includes three alpacas, two potbellied pigs, two miniature cows, one miniature donkey, two rabbits, two pygmy goats, and one miniature pony. 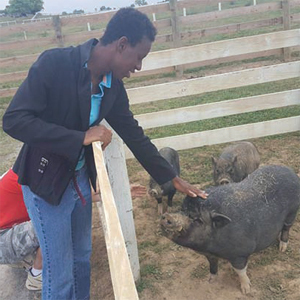 The farm animals, fed and groomed by a Ventures’ crew, are a popular field-trip attraction for area school children, which gives the Ventures’ crew members the opportunity to teach the visitors all about the animals.